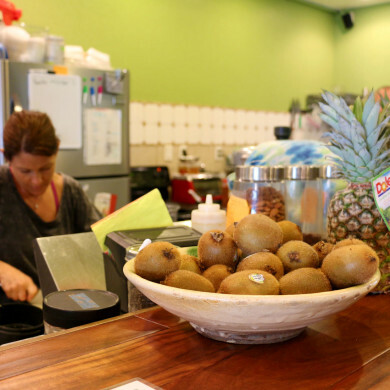 You could say Synergy Organic Juice Bar & Cafe was created out of the synergy between its owners. When Christan Echele and Amy Likins met in the late 1990s, they complemented each other like the fresh fruits and veggies you can enjoy in their handcrafted smoothies today. It was a ‘natural’ fit. These days, the duo is making customers happy with their unique blends of organic juices, smoothies and healthy cuisine. Christian is a classically trained chef, while Amy holds a master’s degree in holistic nutrition and wellness. She’s been teaching yoga on the Emerald Coast for nearly 20 years, and even teaches weekly classes at the cafe. “Together we use the information and knowledge we have gained through more than 40 years combined experience in the kitchen to create the most nutritious, healing and delicious food we can,” Amy says. The pair has also been practicing yoga and meditation together on their journey through life. Along the way, she says, they have developed an awareness that there is a deep, important connection between what we feed our bodies and minds and our overall health and wellbeing. When consuming an organic and whole foods based diet became the centerpiece of the choices Amy and Chris made for themselves, the foods they prepared for others shifted to align with the philosophy. “We created Synergy as a place to support our mission for sourcing and providing organic, nourishing and sustainable food for ourselves and for our community, and to help support local and regional organic and biodynamic farmers by helping to connect people more directly to real food, how it’s made and where it comes from,” Amy says. If that all sounds too good to be true, wait until you try the food. Everything is made from scratch, with the exception of bread for sandwiches. All ingredients are fresh and clean. Whatever your dietary restrictions, options abound for Vegan, Gluten and Grain Free or Paleo eaters. Other requests? Don’t hesitate to ask. If they can do it, they will … with a smile. In addition to the food menu, Synergy also has a full-scale juice and smoothie bar. Drinks are made to order, with no added sugars or unnecessary bulking of processed or packaged ingredients. The wheatgrass shot is equivalent to 5 lbs. of dark leafy greens, a great way to energize, alkalize and cleanse your body all in one, well … shot. The Special of the Day is always a big favorite, chock full of veggies to help you get your 10 daily servings deliciously. The EverQuake – made with avocado, tomato, cucumber, sunflower seeds, sprouts and mixed greens tossed in evergreen marinade – was featured in Emerald Coast Magazine as one of the Top 15 Sandwiches on the Coast. The tuna sandwich is one of Amy’s favorites, with sashimi tuna sourced from small pole-caught tuna, which is sustainable and better for the environment – and better for making a light tuna salad served on a sprouted bun with avocado, tomato and an organic side salad. This cafe should really be called a wellness center. In addition to healthy food and beverages, Synergy is home to nutrition and lifestyle programs and personal consultations to help visitors develop the knowledge and empowerment to make the healthy choices and changes they need to live long and be well. Classes include weekly yoga, cooking and juicing, as well as integrative courses such as the connection between stress and disease, detoxing and cleansing the internal organs, meal planning, physical fitness and personal training. The owners are not lost on the fact that a beachside community lends itself to healthier living. Located just over the bridge from Okaloosa Island to Destin, they get lots of visitors looking for something more than your usual sandwich shop or fried food joint that weighs you down for hours after eating. They’ll even see the same customers again and again throughout a vacation. “Synergy definitely caters to those who are healthy and active and are looking for clean and green fuel to give them the energy to play and replenish from a day at the beach, surfing, boating, playing in the waves or whatever outdoor or indoor activities they enjoy,” Amy says. They love sharing their own favorite places, too. Chris and Amy live only a mile or so from the cafe, so they often ride their bikes to work, enjoying all the natural beauty this small beachside town has to offer, along with the true sense of community you’ll find here. Synergy Organic Juice Bar & Cafe is located at 120 Miracle Strip Parkway in Downtown Fort Walton Beach, FL. For more information including a menu and class schedule, visit the Synergy website or call (850) 865-4919.